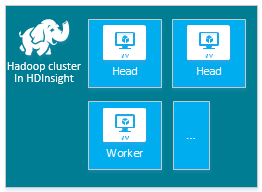 Learn how to set up and configure clusters in HDInsight with Apache Hadoop, Apache Spark, Apache Kafka, Interactive Query, Apache HBase, ML Services, or Apache Storm. Also, learn how to customize clusters and add security by joining them to a domain. A Hadoop cluster consists of several virtual machines (nodes) that are used for distributed processing of tasks. 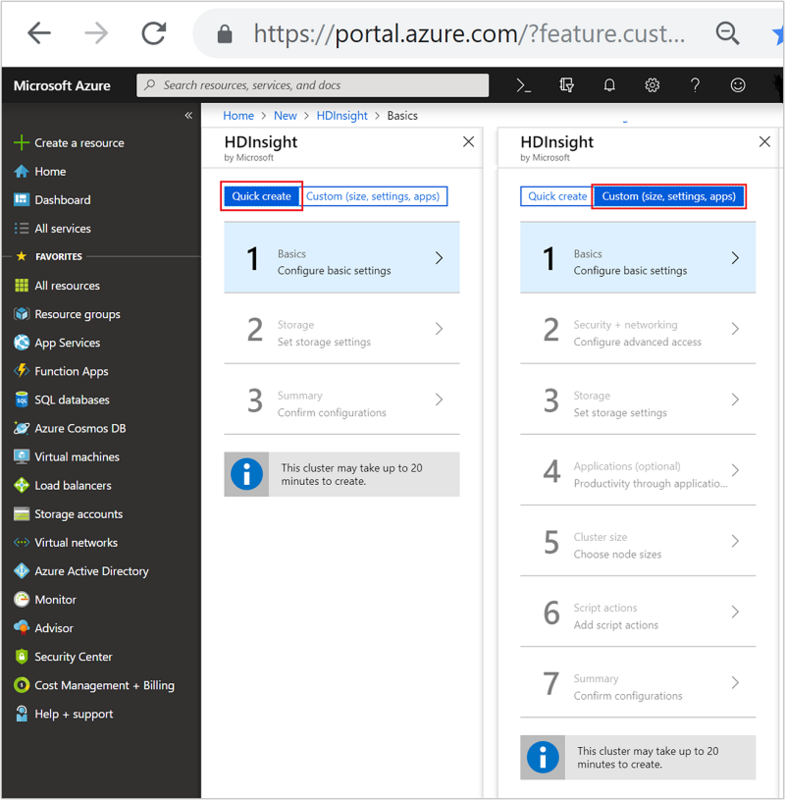 Azure HDInsight handles implementation details of installation and configuration of individual nodes, so you only have to provide general configuration information. HDInsight cluster billing starts once a cluster is created and stops when the cluster is deleted. Billing is pro-rated per minute, so you should always delete your cluster when it is no longer in use. Learn how to delete a cluster. The following table shows the different methods you can use to set up an HDInsight cluster. This article walks you through setup in the Azure portal, where you can create an HDInsight cluster using Quick create or Custom. Linux is the only operating system used on HDInsight version 3.4 or greater. For more information, see HDInsight 3.3 retirement. Azure Resource Manager helps you work with the resources in your application as a group, referred to as an Azure resource group. You can deploy, update, monitor, or delete all the resources for your application in a single coordinated operation. Azure HDInsight currently provides the following cluster types, each with a set of components to provide certain functionalities. HDInsight clusters are available in various types, each for a single workload or technology. There is no supported method to create a cluster that combines multiple types, such as Storm and HBase on one cluster. If your solution requires technologies that are spread across multiple HDInsight cluster types, an Azure virtual network can connect the required cluster types. Choose the version of HDInsight for this cluster. For more information, see Supported HDInsight versions. HTTP user: The default username is admin. It uses the basic configuration on the Azure portal. Sometimes it is called "Cluster user." SSH user: Used to connect to the cluster through SSH. For more information, see Use SSH with HDInsight. The Enterprise security package allows you to integrate HDInsight with Active Directory and Apache Ranger. Multiple users can be created using the Enterprise security package. You don't need to specify the cluster location explicitly: The cluster is in the same location as the default storage. For a list of supported regions, click the Region drop-down list on HDInsight pricing. Although an on-premises installation of Hadoop uses the Hadoop Distributed File System (HDFS) for storage on the cluster, in the cloud you use storage endpoints connected to cluster. HDInsight clusters use either Azure Data Lake Storage or blobs in Azure Storage. 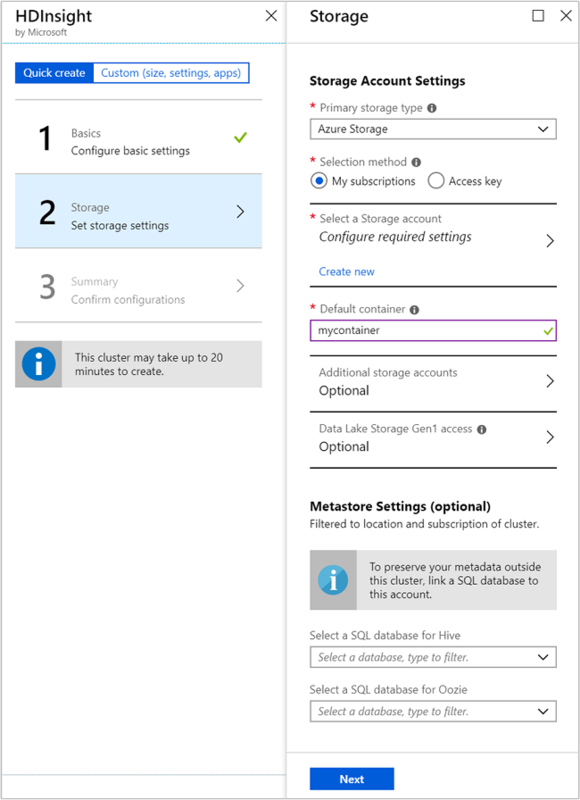 Using Azure Storage or Data Lake Storage means you can safely delete the HDInsight clusters used for computation while still retaining your data. Using an additional storage account in a different location from the HDInsight cluster is not supported. During configuration, for the default storage endpoint you specify a blob container of an Azure Storage account or Data Lake Storage. The default storage contains application and system logs. Optionally, you can specify additional linked Azure Storage accounts and Data Lake Storage accounts that the cluster can access. The HDInsight cluster and the dependent storage accounts must be in the same Azure location. You can create optional Hive or Apache Oozie metastores. However, not all cluster types support metastores, and Azure SQL Data Warehouse isn't compatible with metastores. For more information, see Use external metadata stores in Azure HDInsight. When you create a custom metastore, don't use dashes, hyphens, or spaces in the database name. This can cause the cluster creation process to fail. If you want to retain your Hive tables after you delete an HDInsight cluster, use a custom metastore. You can then attach the metastore to another HDInsight cluster. An HDInsight metastore that is created for one HDInsight cluster version cannot be shared across different HDInsight cluster versions. For a list of HDInsight versions, see Supported HDInsight versions. To increase performance when using Oozie, use a custom metastore. A metastore can also provide access to Oozie job data after you delete your cluster. You cannot reuse a custom Oozie metastore. 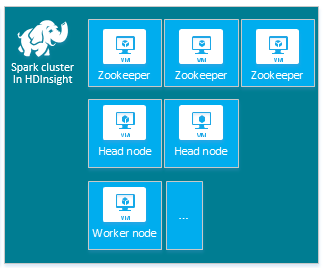 To use a custom Oozie metastore, you must provide an empty Azure SQL Database when creating the HDInsight cluster. For Hadoop, Spark, HBase, Kafka, and Interactive Query cluster types, you can choose to enable the Enterprise Security Package. This package provides option to have a more secure cluster setup by using Apache Ranger and integrating with Azure Active Directory. For more information, see Enterprise Security Package in Azure HDInsight. For more information on creating domain-joined HDInsight cluster, see Create domain-joined HDInsight sandbox environment. An HDInsight application is an application that users can install on a Linux-based HDInsight cluster. You can use applications provided by Microsoft, third parties, or that you develop yourself. For more information, see Install third-party Apache Hadoop applications on Azure HDInsight. Most of the HDInsight applications are installed on an empty edge node. An empty edge node is a Linux virtual machine with the same client tools installed and configured as in the head node. You can use the edge node for accessing the cluster, testing your client applications, and hosting your client applications. For more information, see Use empty edge nodes in HDInsight. You are billed for node usage for as long as the cluster exists. Billing starts when a cluster is created and stops when the cluster is deleted. Clusters can’t be de-allocated or put on hold. Each cluster type has its own number of nodes, terminology for nodes, and default VM size. In the following table, the number of nodes for each node type is in parentheses. 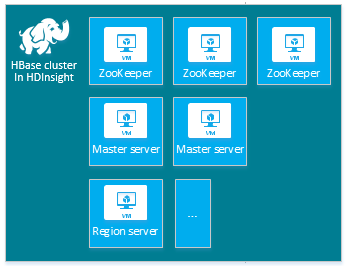 For more information, see Default node configuration and virtual machine sizes for clusters in "What are the Hadoop components and versions in HDInsight?" The cost of HDInsight clusters is determined by the number of nodes and the virtual machines sizes for the nodes. If you are just trying out HDInsight, we recommend you use one data node. For more information about HDInsight pricing, see HDInsight pricing. The cluster size limit varies among Azure subscriptions. Contact Azure billing support to increase the limit. 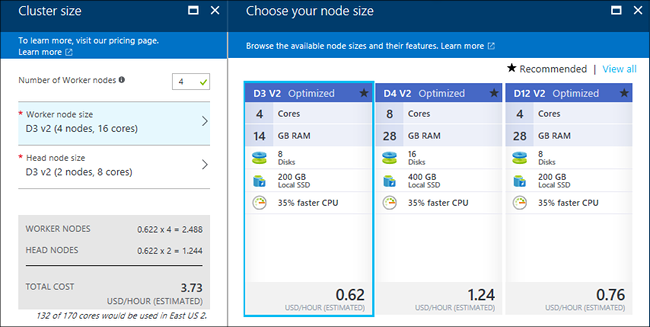 When you use the Azure portal to configure the cluster, the node size is available through the Node Pricing Tiers blade. In the portal, you can also see the cost associated with the different node sizes. To find out what value you should use to specify a VM size while creating a cluster using the different SDKs or while using Azure PowerShell, see VM sizes to use for HDInsight clusters. From this linked article, use the value in the Size column of the tables. If you need more than 32 worker nodes in a cluster, you must select a head node size with at least 8 cores and 14 GB of RAM. For more information, see Sizes for virtual machines. For information about pricing of the various sizes, see HDInsight pricing. You can install additional components or customize cluster configuration by using scripts during creation. Such scripts are invoked via Script Action, which is a configuration option that can be used from the Azure portal, HDInsight Windows PowerShell cmdlets, or the HDInsight .NET SDK. For more information, see Customize HDInsight cluster using Script Action. Some native Java components, like Apache Mahout and Cascading, can be run on the cluster as Java Archive (JAR) files. These JAR files can be distributed to Azure Storage and submitted to HDInsight clusters with Hadoop job submission mechanisms. For more information, see Submit Apache Hadoop jobs programmatically. If you have issues deploying JAR files to HDInsight clusters, or calling JAR files on HDInsight clusters, contact Microsoft Support. Cascading is not supported by HDInsight and is not eligible for Microsoft Support. For lists of supported components, see What's new in the cluster versions provided by HDInsight. For more information, see Customize HDInsight clusters using Bootstrap. 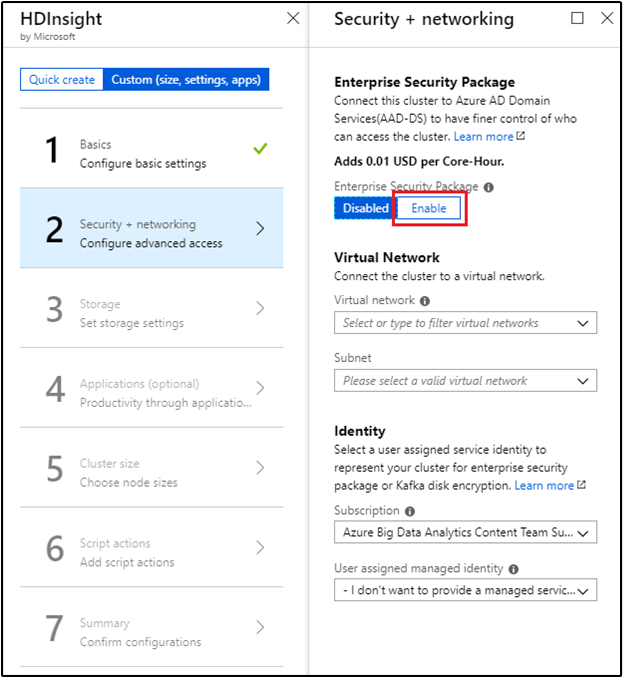 If your solution requires technologies that are spread across multiple HDInsight cluster types, an Azure virtual network can connect the required cluster types. This configuration allows the clusters, and any code you deploy to them, to directly communicate with each other. For more information on using an Azure virtual network with HDInsight, see Extend HDInsight with Azure virtual networks. For an example of using two cluster types within an Azure virtual network, see Use Apache Spark Structured Streaming with Apache Kafka. For more information about using HDInsight with a virtual network, including specific configuration requirements for the virtual network, see Extend HDInsight capabilities by using Azure Virtual Network. What are HDInsight, the Apache Hadoop ecosystem, and Hadoop clusters?